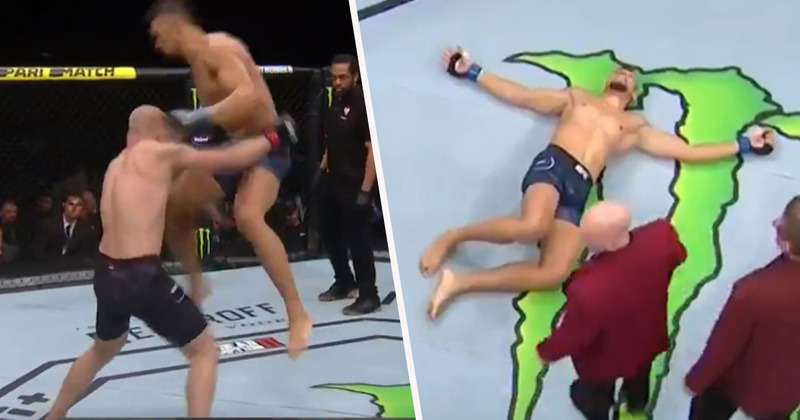 A UFC fighter got a bit carried away with his celebration after a knock out victory, and ended up momentarily putting themselves out of action in the process. Johnny Walker was fighting Misha Cirkunov in Las Vegas yesterday (March 2), resulting in a win which will see Walker continue to rise within the UFC’s light heavyweight division. It took the Brazilian just 36 seconds to defeat his opponent, but as impressive as the win was, unfortunately for Walker, it wasn’t the most talked-about moment of the bout. To celebrate his victory, the 26-year-old proudly saluted the crowd before collapsing to the floor in a move which could have been labelled ‘dying of happiness’, but was actually an attempt at his signature ‘worm’ celebration. Walker put his arms forward as he fell, and as a result he hit the ground flat on his face, knocking his left shoulder as he did so. Like a fish out of water, the fighter then flopped onto his back and grabbed his left arm in pain, probably really regretting the way he’d decided to celebrate. He lay on the canvas for a couple of minutes and was checked over by a doctor, before admitting to Joe Rogan he’d knocked his shoulder out of its socket. Yeah. A little bit. My shoulder. Well don’t do that again sir, please. ‘Cause you have so much potential, I’d hate to see you get taken out of the game from celebrating. Hopefully Walker had his shoulder popped back in, and he’ll be good to enter the Octagon again in no time – though preferably with some amended celebration techniques!